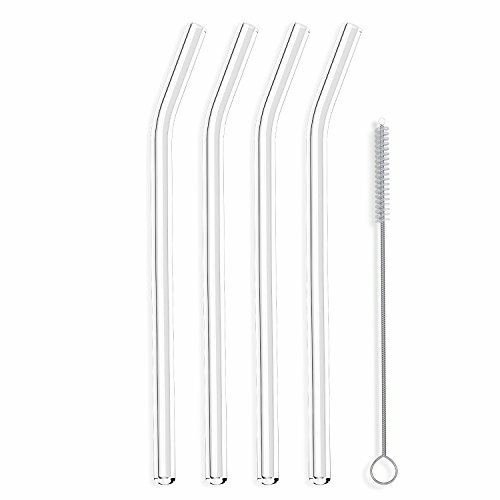 Sip your way to saving Mother Earth with glass drinking straws. Say NO to plastic straws! I may not be able to save Mother Earth from her children but I can certainly do something to make a difference in her world and so can you. Today, I hope to convince you to join me in saying NO! to plastic straws. My personally tried and true best suggestion for you is to sip your way to saving our planet Earth with glass drinking straws. While I thoroughly enjoy and partake of the gifts nature provides, I have probably not ever been described as an environmentalist. However, I have come to realize (finally) that many of the items I use in my daily life are not good for the planet. And that means these things are in all probability not good for me either! Plastic drinking straws are but one of the items in a long list of products we use that in their end do pollute the environment in which we live. Many of these straws are known to leach toxins into our drinks, especially when these straws are used for drinking hot liquids. Plastic drinking straws that go from our trash cans to our landfills do not break down quickly and are found for many years to be leaching these same toxins into our environment. Even biodegradable straws may take years in the decomposing process. While there are several alternatives to the use of disposable plastic straws for drinking, my research has led me to choose glass as my plastic-free drinking straw of choice for sipping cold and hot beverages. 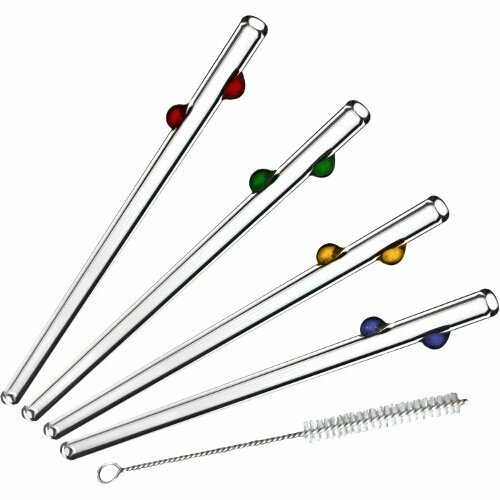 My choice of plastic-free drinking straw is the Decorative Dots set, by Glass Dharma, Purchased on Amazon. I selected this set for its beauty and functionality, as well as the fact that it would be handy to have an extra on hand for a friend. I like that the set has multi-colored offerings, making it easy to know which glass I'm sipping from in a crowd. 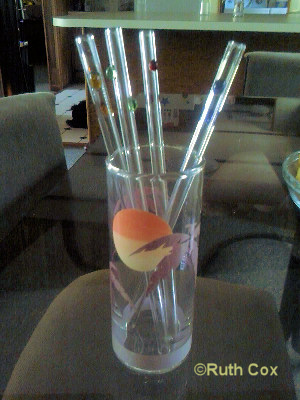 And, it comes with a handy little cleaning brush too, although I rarely use it as I run my straws through the dishwasher. These delightfully decorative glass straws have graced my drinking glass for well over a year now and I also travel with one in my purse so that I have it when dining out in restaurants. A photographer I am not but I will show you what I've got! Ruthi sips a smoothie with a glass straw. If you drink smoothies, with which straw do you do your smoothie sipping? 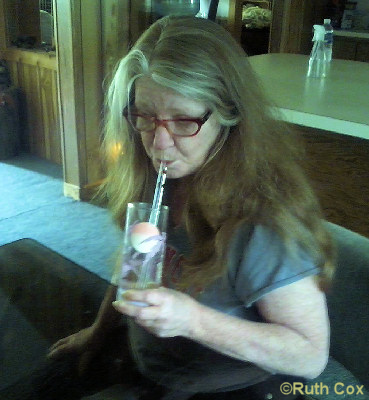 Smooth sipping with a glass straw is the way I sail along to a healthy lifestyle. Non-breakable stainless steel straws are my sipping utensil of choice. Mother Nature frowns on me as I still use plastic or paper drinking straws. 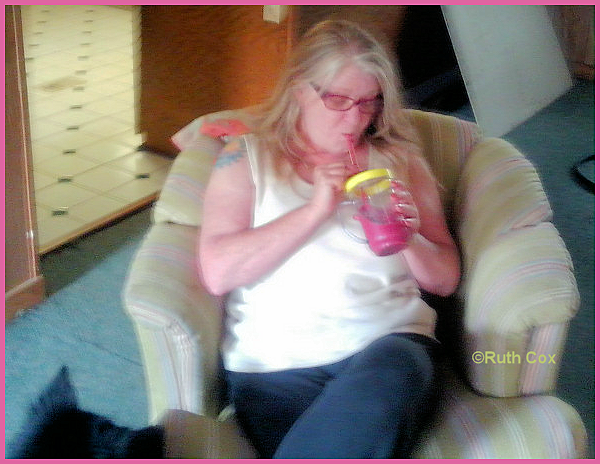 No straws for me but I do indulge in a smoothie now and again. Here I shall address some of the concerns I had when I first heard of glass drinking straws, concerns you may have as well. Additionally, I will highlight a few features I discovered in my research that led me to choose glass as my alternative to plastic straws. DURABILITY: Most glass drinking straws are made from borosilicate glass tubing; glass which is superior in durability and heat resistance. Glass straws are not invincible! Breakage may occur when abruptly dropped onto a hard surface or sharply banged against a solid object. 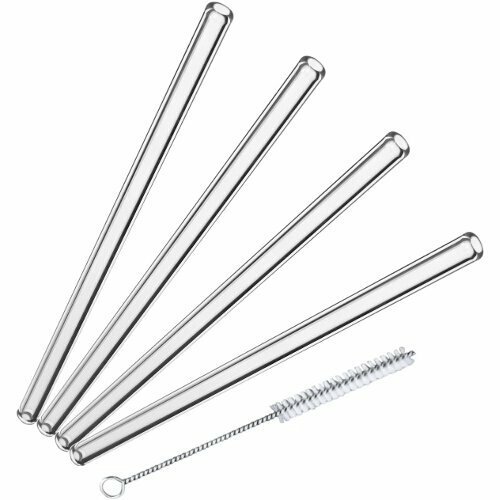 Purpose-driven, I have dropped my new glass straws from a standing position onto carpeted flooring, dropped them fairly sharply upon my kitchen countertop, and again dropped them on my glass top table - no broken straws! I must admit I feared a purposeful drop onto my ceramic tile kitchen floor and this durability test I have not yet performed. 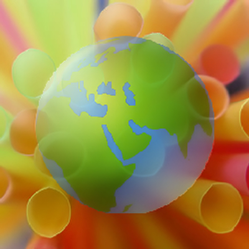 CLEANABILITY: I have found my glass straw quite easy to clean. I rinse it clean with hot soapy water after each use. After a thick vegetable or fruit smoothie drink, I have used the glass straw cleaning brush to make sure the straw is free of any food remains. CHILD-FRIENDLY: While I do not have children in my home, I would not have had any hesitation whatsoever in introducing my son to a glass drinking straw when he was a toddler. Of course, I would have done so with supervision, as I recommend all parents do with their small children. Naturally, accidents do happen, but I am confident that most well-behaved kids will do just fine with these straws with proper guidance. I do feel that children would find the bent glass straw easier to use and more fun to drink with, too. ECO-FRIENDLY: We are talking trash and toxins here (think BPA) leaching into our environment as millions of straws end up in our landfills, our waterways, and are added to the litter in our streets. Sure, I could have chosen to use paper straws as my alternative to plastic, but then again, these would be disposable, again creating waste. Biodegradable or not, the impact on our environment would be detrimental. Just because it can be broken down in a shorter amount of time does not necessarily mean it is good for the environment - or for you and me! 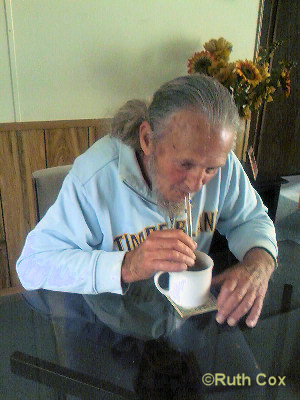 No doubt Mother Earth is pleased to see me sipping my beverages, hot and cold, with my eco-friendly straw! 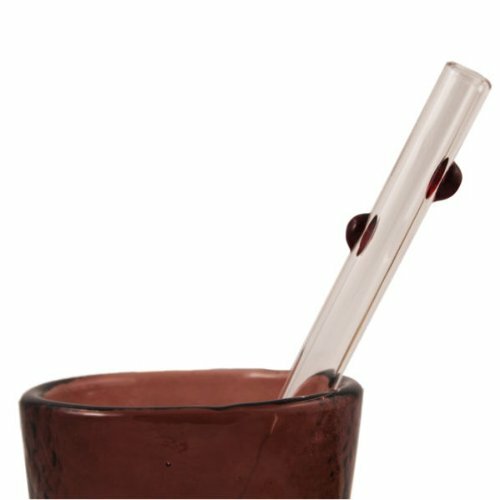 These features of Glass Dharma straws clinched my personal choice. Glass Dharma products are Made in the USA! That means they travel less distance to get to me and my purchase aids business and its workers in my country. The company stands by their products with a lifetime guarantee! If I break my straw, they will repair or replace it for free. Perhaps you do not care for the author's choice of the decorative dots on her straws. (Shown above.) No problem! Whether it be that you just want one straw, straws with a bend, or straight straws, your choices are many. How many straws does a restaurant go through in a year? I have worked in the restaurant and bar industry on and off for decades. I have seen a lot of straws used for drinking! That equals 36,000 straws per year! And that is just one family-style restaurant in a small-town tourist community. Thankfully, Ken was a good sport about my article, even though he doubts many can make the switch from straws being provided by the food industry to restaurant goers bringing their own reusable glass straws. It is my hope that more people will take the pledge and begin carrying their own glass drinking straws with them. It would be a win-win situation for the environment as well as for restaurant owners. Hog Wild Bar-B-Q logo is © Hog Wild Bar-B-Q. Used with permission. McDonald's serves close to 68 million people per day worldwide. One wonders ... How many straws would that be per day? And where might most of those straws end up? In to Flameworking? 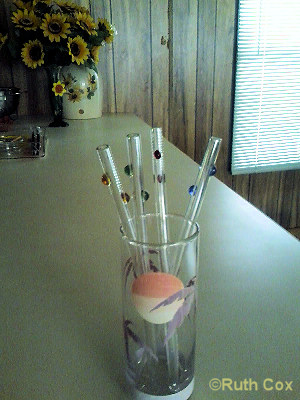 Make your own glass drinking straws! According to the Earth Society Foundation, Earth Day is observed internationally on April 22nd. While this would be the perfect day to pledge to switch from plastic to glass drinking straws, I urge you not to wait - get your glass straw today! As a mom, and grandmother, I think each child is different and the parents and caretakers of each would know what is best for them, so yes, that age specification might work out just fine for you as well as others, Henry. Interesting concept. I remember when my children were small and we had the bite of a drinking glass, then getting the pieces out of the mouth. I am wondering if very young children might bite a piece off. Perhaps ages four and up might be a good age range. Sandy, there is a brush included with the set I purchased. Honestly, I have not used it, as I rinse the straw after use and run it through the dishwasher a couple of times a week. I have sen these but have not tried them. How do you clean the drinking straws? Is there a brush or something you can buy extra to clean the straws? Thank you, quinn.blackburn. It truly is. The damage palstic straw do to our earth, to our animals, is not a good thing at all. WriterArtist, I agree with you, plastic is everywhere and in nearly every household product now. I am doing my best, one item at a time to remove as much plastic from my life as possible. To me, it's not even about recycling it, it's about not purchasing it in the first place. How much I want to do without the plastic but it finds it way everywhere. I see them thrown everywhere - plastic bottles, bags etc. The idea of drinking straws made of glass it great, it looks classy and robust. Yes, Mira, there is a cleaning brush with the decorative dots straws I use. You are correct in that it would be difficult to remove all plastic from our lives, but I feel we can do so one item at a time and using glass straws instead of plastic is an easy one. I never drink out of plastic bottles anymore, either, I use a stainless steel thermos, or if I must purchase something to drink, I buy it in glass containers. How amazing. 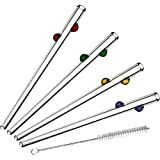 There are already glass straw cleaning brushes (you mentioned them and they also show up in that inserted image from Amazon). I'm a little skeptical about how we can avoid plastic, given that coffee machines filter coffee through plastic too, we drink from plastic bottles when we're in town, etc., but it's a step forward. Looking for eco-friendly kitchen utensils? Then look no further. From pizza cutters to chopping boards; stylish, practical and affordable utensils can be found on this page. Buy vegan and eco-friendly handbags and join with others who want to prevent cruelty to animals and protect the world's resources.